Tottenham Hotspur took advantage of their timely break last week as they managed to get all three points at the Liberty Stadium with goals from Fernando Llorente and Dele Alli. Manchester City got back to winning ways as they thrashed Watford 3-1 at the Eithad to increase their lead to 15 points. With manager Mauricio Pochettino deciding to keep Harry Kane on the bench, Spurs fans had their reservations, but summer recruit Fernando Llorente cleared them all with a 12th-minute header to give his side the lead on a wet and windy day against his former club. With the pitch not ideal for passing the ball, which Spurs specialize in, the goal unsurprisingly came from a free-kick by Christian Eriksen that was clinically headed in by the Spaniard. However, the South Wales club didn’t make it easy for the visitors from thereafter with the likes of Luciano Narsingh, Jordan Ayew, and Mike van der Hoorn, all coming close to equalize as half-time approached. However, they were made to regret their missed chances right in the 89th minute when Alli scored from a rebound after collecting a marvellous pass by Kane. Spurs have now moved up to fifth on the table with this win while Swansea remain rooted to the bottom of the table four points from safety. In a season that is increasingly likely to see Manchester City go unbeaten after the Arsenal Invincibles of 2004, the Sky Blues got a real scare in the last game as Crystal Palace came agonizingly close to breaking it, but for a missed penalty at the last minute. However, Pep Guardiola’s men shook it off in no time as they managed a convincing win away in Watford with Raheem Sterling taking as little 39 seconds to score the fastest goal of the season. Leroy Sane put in a cross into the back-post right after the kick-off that found its way to Sterling, thanks to some slack defending by Watford, who was waiting to tap it in. As if that wasn’t sufficiently discouraging for the Hornets’ defence, Christian Kabasele then managed to divert a Kevin De Bruyne's cross into his own net 12 minutes later. 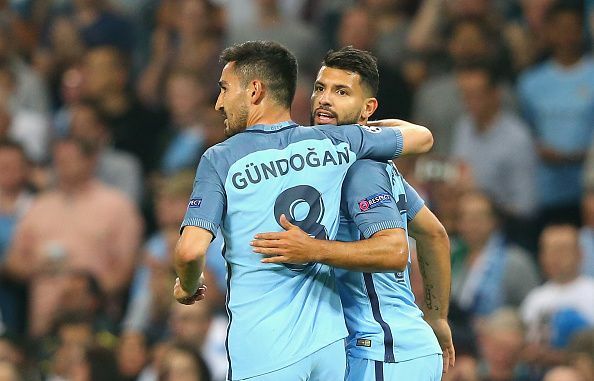 Striker Sergio Aguero piled more misery on the hosts with a goal in the 63rd minute after goalkeeper Heurelho Gomes had spilled from De Bruyne’s cross. Andre Gray, however, got a late consolation for the hosts from Andre Carillo’s cross.